The phone rings. Friend of Jalopnik and cross-country record holder Alex Roy is on the other end. It's a simple conversation: "I'm outside the office. Come downstairs and see my new car." This is a man who daily drives a Morgan Three Wheeler, so I could only imagine what would be waiting for me. I was outside in seconds. I expect that I'll be greeted by a Caterham or a Citroen DS. What I see isn't close, but it's all sorts of great. 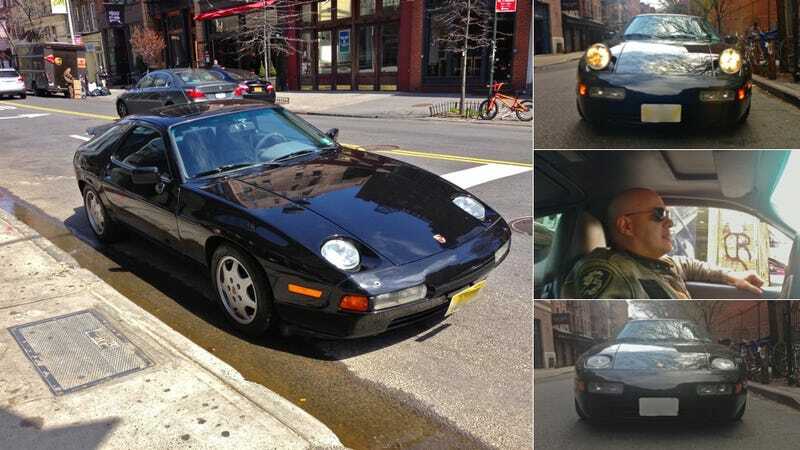 It's a 1991 Porsche 928, and it's in fantastic shape. I like 928s (always have), and I tell that to Roy. Roy, his normal ebullient self, laughs like mad as we walk around his new ride, seemingly still in shock that he purchased a car many would consider the most unreliable Porsche ever built. The 928 was introduced as what Porsche saw as the replacement for the 911. They don't make the 928 anymore, so you know how that panned out. Today, it's the Porsche for the man that knows that Porsche builds fantastic rear-engined, flat-six, manual transmission sports cars, and wants none of that. Instead, what you get is a V8, German Corvette with rear seats and a dog-leg trans. Everything about this is wrong. Like really wrong. Really, really wrong. Roy throws me the keys. "Let's get lunch." Every single part of this car is heavy. The gear shift is like opening the locks of the Panama Canal. The clutch is like trying to crush a steel girder with your foot. The steering takes more effort than changing someone's political positions. You can't see out of it at all. It has gigantic buttons for everything from the air con to the trunk release (one for the driver and one for the passenger!) to the trip odometer reset. It has rear AC controls and rear sun visors, because who doesn't want to be chauffeured in a 928? In a word, it's magnificent. I only get to step on it twice in Manhattan traffic, and briefly hit third gear. Roy describes that car as being "all legs," but he quickly takes that back. We agree that it's "all chest." Hairy chest, probably. Power is linear and oh so plentiful. But it's nothing like any other Porsche I've ever been in. Porsches have always had this sense of immediacy, like you were driving a precision instrument. Instead, this feels like you're driving a fat man that is also a sprinter. There is nothing about this car that makes me say "let me see how it'll do on a track." There are a lot of things that make me wonder just how good it would be transporting tons of cocaine. We park outside his favorite lunch spot, a spot that normally has people gawking at a Morgan Three-Wheeler. The 928 is the opposite of a Morgan Three-Wheeler. It can hold a Three-Wheeler in the trunk. As we eat and talk, Alex keeps one eye on the P car. A cop approaches, and Alex runs out to make sure he doesn't get a ticket. Instead, the cop tells Alex he is admiring the car. Not bad for a 22-year old ride. But then, disaster. The car isn't parked in what anyone would call a "legal" spot. Just before we leave, the car gets a ticket, Roy's first ever there, and on the second day he owns the car. "I'm framing this one," he says as we get back in the car. Roy drives me back to the office, where our own Raphael Orlove is waiting for us. He didn't see the car when we left. The first words he says to Roy? "You idiot! What have you done?!" What has he done? Something wonderful.